Gold and Silver have been around forever….or it seems to me…but Copper hasn’t and I’m in love lately. I just can’t get enough Copper!!! The Joyous Noel Suite from the Holiday Mini Catalog has lots of Copper! The texture and shine on this card is just stunning!!! It’s also super easy too so this is a great card to make multiples for Christmas! I started with a piece of Sahara Sand for my card base. Next I cut a piece of Copper Foil Paper (2″ x 5-1/4″) and ran it through the Big Shot with the Tufted Embossing Folder. That is my favorite folder right now as well as the Tin Tile Embossing Folder. Also, I cut a piece of the Joyous Noel Designer Series Paper in a 2″ x 5-1/4″ piece. Then I added these two pieces to the card front! 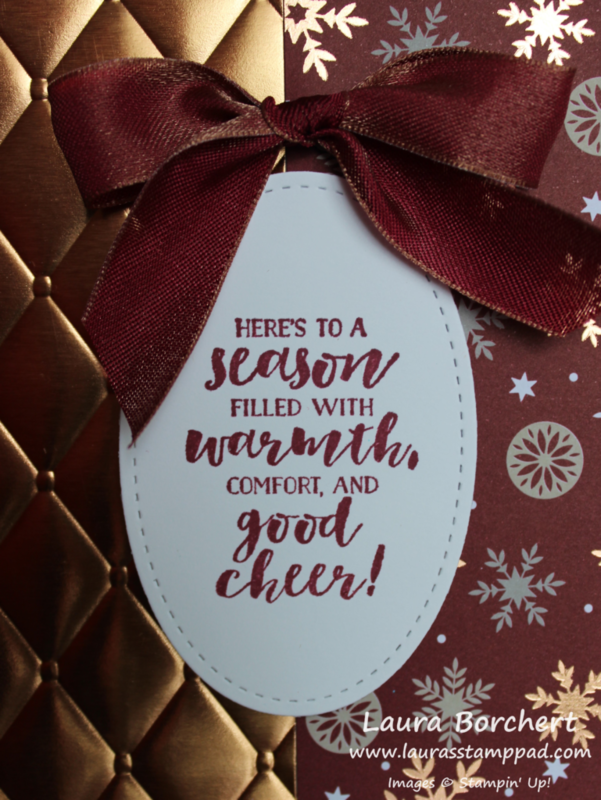 For the greeting, I die cut an oval using the Stitched Shapes Framelits and stamped the greeting in Merry Merlot Ink. The greeting is from the Peaceful Noel Stamp Set. 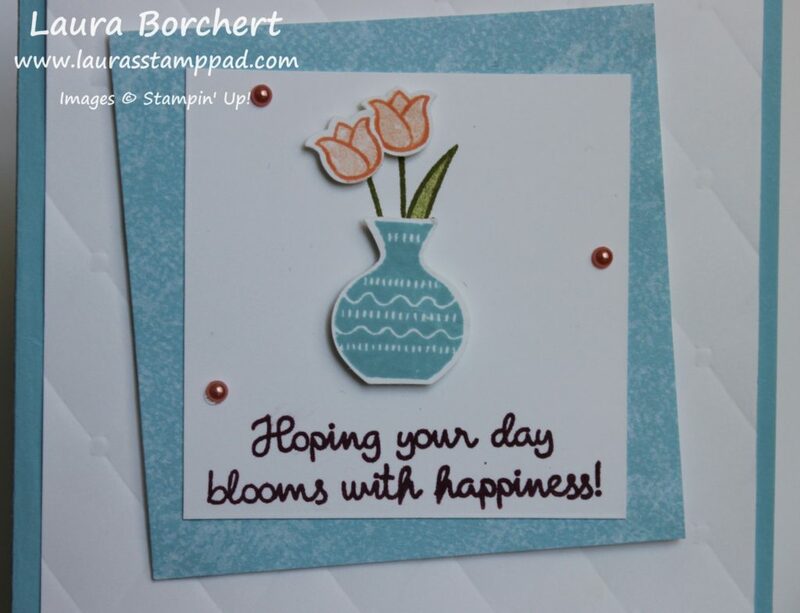 I added the greeting with Stampin’ Dimensionals. To finish it off, I added a bow made from the Merry Merlot and Copper Ribbon. I used Mini Glue Dots to adhere it to the card front. I love it! Are you a big Copper fan? Or do you like Silver or Gold more? Let me know in the comments below! 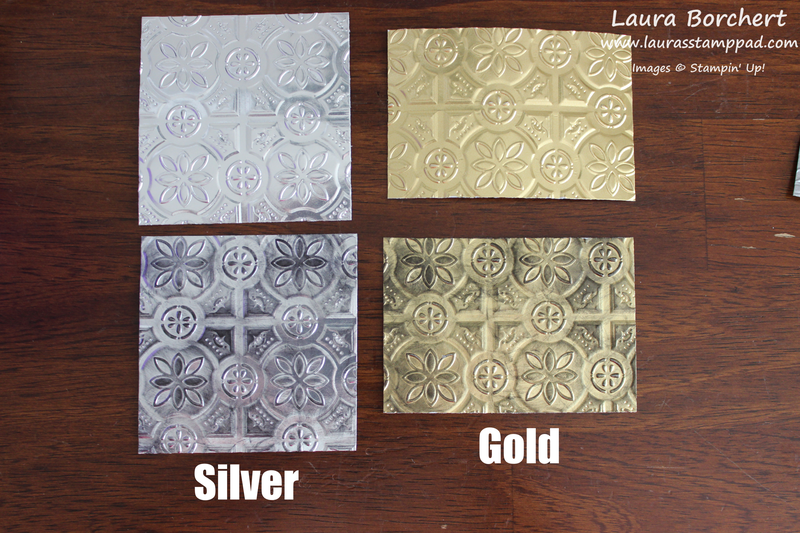 Galvanized Metallic & Tin Tile!!! Happy Friday everyone!!! Yesterday, I shared the Tin Tile Embossing Folder and all the cool looks with foil paper. Today, I’m sharing a sample I created using the Galvanized Metallic & Tin Tile Folder!!! That Galvanized Metallic Paper goes together so well with Rich Razzleberry, don’t you think??? I love it!!! I started with a Mint Macaron card base measuring 4-1/4″ x 11″. Then I cut a piece of the Galvanized Metallic Paper (4″ x 3″) and ran it through the Big Shot with the Tin Tile Embossing Folder. I just love how detailed and fabulous that folder is. Check out yesterday’s post to see more on this folder. Also, I cut a piece of the Country Lane Designer Series Paper (4″ x 3″). Next, I added these to the card front, overlapping them in the center. You can decide which one you want to show more. For the focal point, I started by adding some Tear And Tape all along the overlap of the papers. Then, I pressed some Rich Razzleberry Velvet Ribbon into it and trimmed the ends flush with the edge of the cardstock. Normally I wrap the ribbon around to the back but I thought I would try something new this time since this ribbon is a little more bulky and I didn’t want it to cause a bump. The greeting was stamped in Rich Razzleberry from the Country Home Stamp Set from the Holiday Mini Catalog. 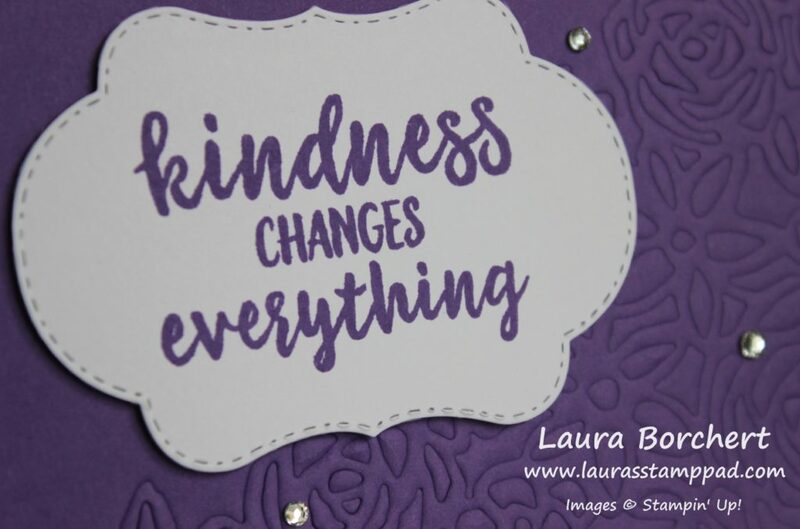 Using the Everyday Label Punch, I punched it out and added it to the card front with Stampin’ Dimensionals for a smooth look over the ribbon and they press into the embossed image better. To finish it off, I added some Frosted Epoxy Droplets to the ends. The frosted look goes well with the rustic paper! It’s just perfect! I hope you all have a wonderful weekend! I’m super excited because it’s our Annual Family Reunion and I just love weekends full of family time! Oh my goodness, my favorite product by far in the Holiday Mini Catalog is the Tin Tile Embossing Folder. It is just stunning on a project and looks amazing with foils! The intricate details in the folder are just amazing! I love all the texture and the elegant look! To me, this folder was meant to be for foil papers!!! It’s just stunning! As you can see I used different foils in the photo above. I even used this new Galvanized Metallic Paper!!! It’s like the perfect brushed silver look. Then I had some fun adding some black ink with a Sponge Dauber for a more rustic look. I really like the look on some of the foils and not so much on others. 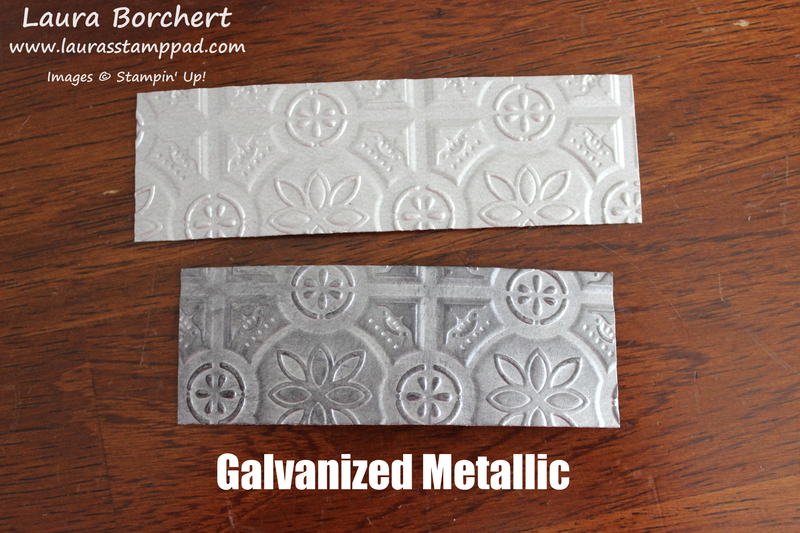 The Galvanized Metallic looks super cool since it has that rustic look and a less shine and glitz. I kinda love this technique a bit! Of course some of them are darker and others are lighter. I simply rubbed some black on very quickly. I could always go back and add more or keep it light and dark for a more rustic look! Which one is your favorite?? Let me know in the comments below! 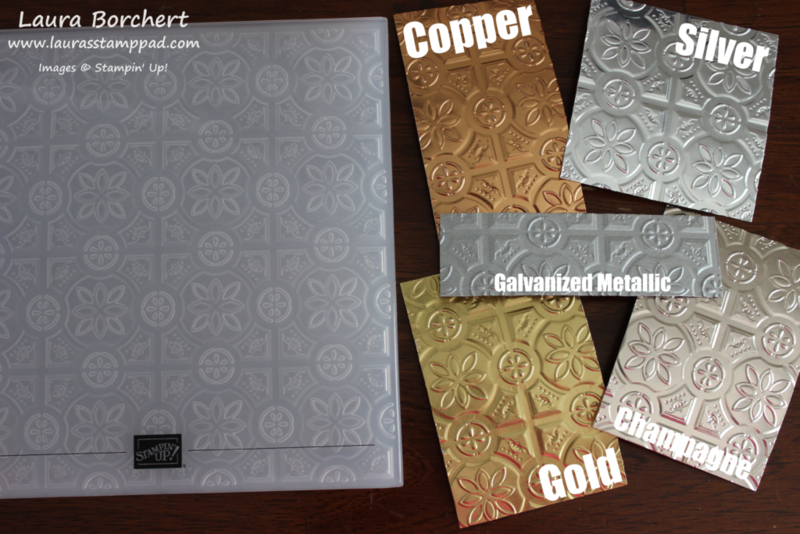 Check back tomorrow to see a sample using the Tin Tile Embossing Folder!!! Don’t have this folder in your collection yet, click the photo below to get it!! Yesterday, I shared some embossing with framelits as well as a card using the label from the Stitched Seasons Framelits. Check that out here! Today, I’m sharing another card embossed with framelits and I’m using the outline/negative of the label I die cut. I started with a Whisper White card base. Next, I took a piece of Coastal Cabana measuring 4″ x 5-1/4″ and embossed the floral image from the Stitched Seasons Framelits. I added it to the top and bottom for a nice border around the greeting! Here are the layers for embossing with a framelit: Big Shot Platform (no tabs), White Impressions Pad, Blue Silicone Mat, Cardstock, Die with the blade facing the cardstock, and then a clear Big Shot Cutting Pad. Simple and yet such a fabulous look! I added this to the card front and tied some Silver Metallic Edge Ribbon along the spine of the card. For the greeting, I used the outline/negative image from the label I cut out for this card. Simply place the outline in the middle where you would like it to be, stamp the greeting in the center and then adhere the outline with Stampin’ Dimensionals. If you add the outline with the dimensionals first, the stamped image won’t be as easy to place without making a mess. The greeting I used is from the Stitched All Around Stamp Set and I used Coastal Cabana Ink. I finished off the card with some Rhinestones for bling! I’m really loving Rhinestones in all of my cards lately. Do you find that you really love a product and grab for every time you are crafting but yet it changes all the time too? I use to using embossing folders on every card and then I just quit. Now I’m back to it and loving it. I use to use Pearls and Rhinestones on every card and then I started using other embellishments….now I’m back to using them! I find that super interesting. Let me know yours in the comments below!!! Also, if you would like to see a video tutorial on this, check that out here! If you would like to purchase any supplies used, click the links below! The Stitched Seasons Framelits are only available this month while supplies last so don’t delay! Technique Tuesday – Creating 2 Cards with 1 Die! Happy Tuesday!!! You all know that means I have a fabulous technique to share!!! Creating 2 Cards with 1 Die is the technique!!!! Today, I’m sharing one of the cards but be sure to come back tomorrow to see the other one!!! I love this because we all know time is precious so getting 2 pieces with one crank through the Big Shot is fabulous!!! 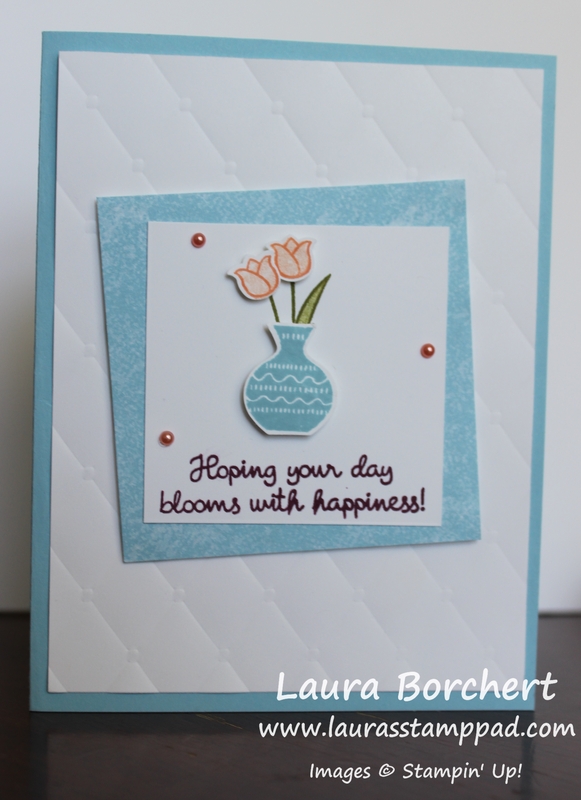 This card is super simple to create but has that amazing WOW factor with the embossed floral image. I used the Springtime Impressions Dies for that image. Yes, I used a framelit to emboss! How cool is that???? With the Big Shot Embossing Mats, you can now get more use out of your framelits because now you can emboss with them as well. WOWZA!!!! Then, there is also the creating 2 cards with 1 die part for this card. I love it! I started with a Whisper White card base. Next, I layered on a piece of Highland Heather measuring 4″ x 5-1/4″. Then, I took a piece of Gorgeous Grape and ran it through the Big Shot with the Embossing Mat and the Springtime Impressions Die. 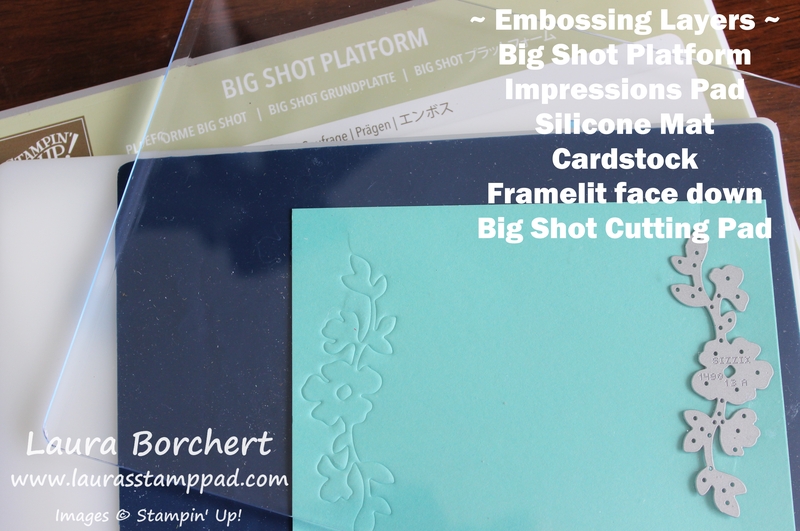 Here are the layers for embossing with a framelit: Big Shot Platform (no tabs), White Impressions Pad, Blue Silicone Mat, Cardstock, Die with the blade facing the cardstock, and then a clear Big Shot Cutting Pad. I have found that using a newer pad works best because it doesn’t have the cutting groves in it and it isn’t curled. It’s always good to have a nice flat one available for embossing!!! Now I have that fabulous focal point to adhere to the front of my card! Next, I took a piece of Whisper White cardstock and ran it through the Big Shot with the Stitched Seasons Framelits. I used the label for this card and saved the negative (outside piece) for the card I’m showing off tomorrow! Two fabulous card pieces with just 1 crank through the Big Shot and 1 die. The Stitched Seasons Framelits are super fabulous for that reason! Remember you can only get them this month! Click the photo below to order yours today! 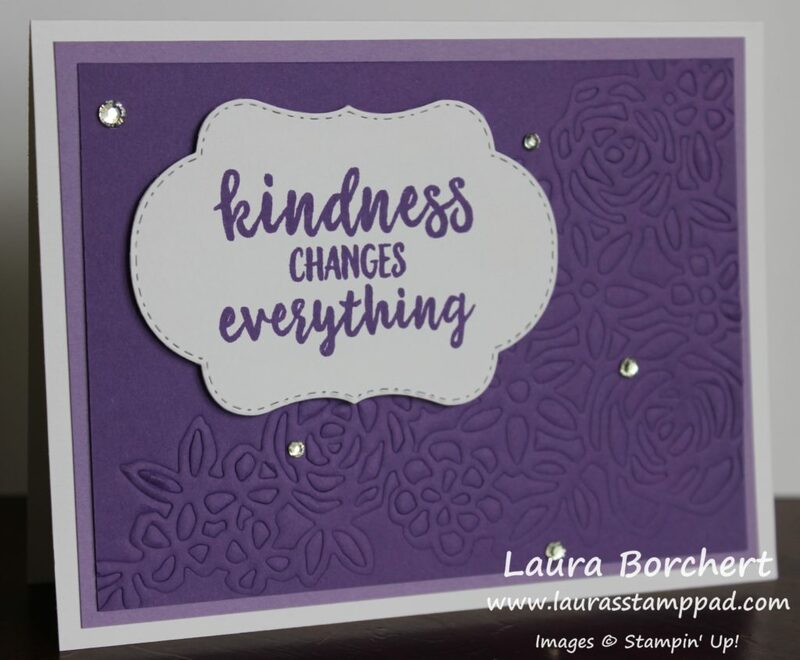 Using the greeting from the Abstract Impressions Stamp Set (coordinates and Bundle & Save 10% with the Springtime Impressions Framelits), I stamped it in Gorgeous Grape! 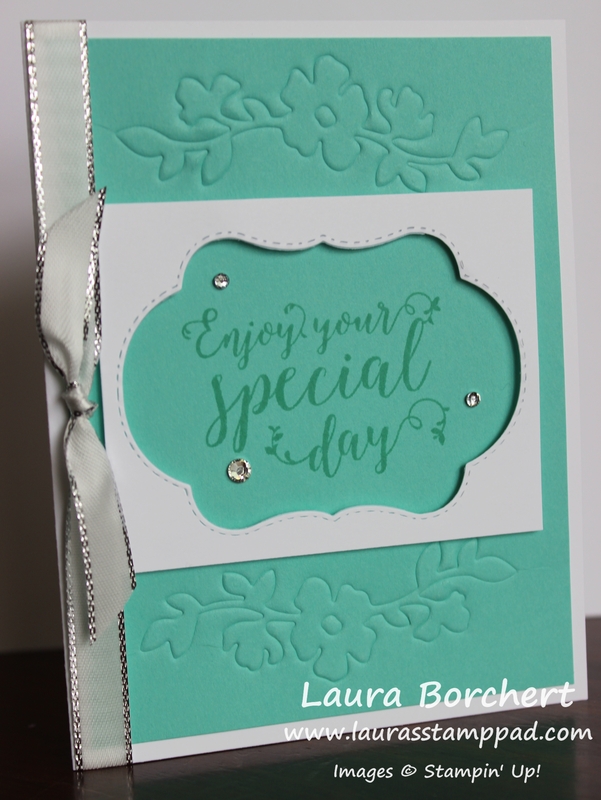 I added the greeting to the card front with Stampin’ Dimensionals and finished off the card with Rhinestones. Simple and yet fabulous with that beautiful floral embossing. I love it!!! To purchase any of the items used, click the photos below! Don’t forget the Stitched Seasons Framelits are available this month only! Check out the Video Tutorial for creating 2 cards with 1 die below or click here to see this all in action! I hope you found this super useful. Be sure to give the video a thumbs up if you liked it and don’t forget to subscribe if you are new. If you would like a notification when I post a new video, be sure to click the bell right next to the subscribe!!! Happy Wednesday!!! Woot woot for the middle of the week already!!! I hope your day blooms with happiness each and every day!!! This card surely would help, wouldn’t it?? 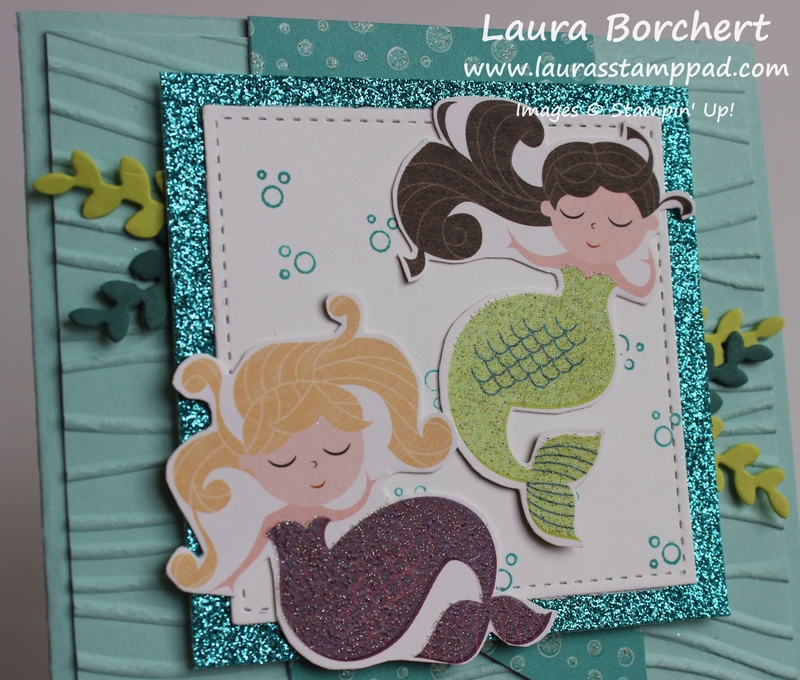 Yesterday, I talked about the amazing tip using the Tufted Embossing Folder and here is the card I was using it on! I just love that textured background. It’s subtle but also adds so much to the card! I started with a Balmy Blue card base. 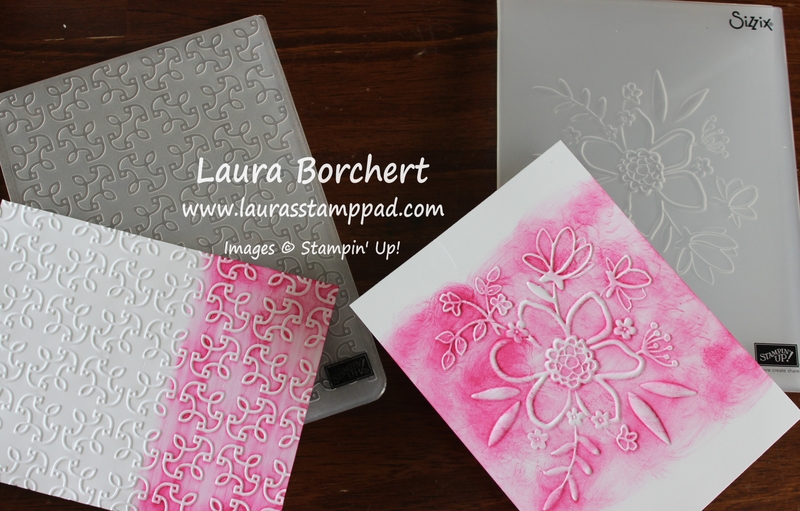 Next, I took a piece of Whisper White (4″ x 5-1/4″) and ran it through the Big Shot in the Tufted Embossing Folder. Then I added this to the card front. For the focal point, I cut a piece of Tranquil Textures Designer Series Paper into a 3″ square. That means you can get 16 of these from one sheet of paper! The Whisper White piece measures 2-1/2″ x 2-1/2″. Now here comes the tricky part….but don’t worry I did the leg work for you. After four tries, I nailed it! 🙂 First, I stamped the greeting from the Varied Vases Stamp Set in Rich Razzleberry. Then, I punched out the vase using the coordinating Vases Builder Punch with some scrap paper. This will be your guide for stamping the stems. Place the scrap vase on the white square above the greeting but not so high that you don’t have room for your flowers. Next, I stamped the stem and leaf in Old Olive Ink. TIP: Since the stems and leaf are so long/big, you might need to place a scrap piece of paper down to mask the vase so that you don’t have a stem popping out the side of your vase. To achieve this, I placed a larger scrap piece over the scrap punched vase and made marks on the paper on either side of the vase lip. This helped me know that I needed to stamp the stems inside that area so that it would fall inside the vase. Once the stems and leaf were stamped, the rest is easy. Simply stamp the vase in Balmy Blue onto scrap Whisper White and punch it out. The tulips were stamped in Grapefruit Grove and punched out. I stamped the outline in full strength and the inside image stamped off once for a lighter shade. Using Mini Stampin’ Dimensionals, I added these to my project. I off set the two squares for a fun little look and finished off the card with a few Share What You Love Pearls. Don’t forget the Buy 3, Get 1 Free Designer Series Paper Sale going on this month. 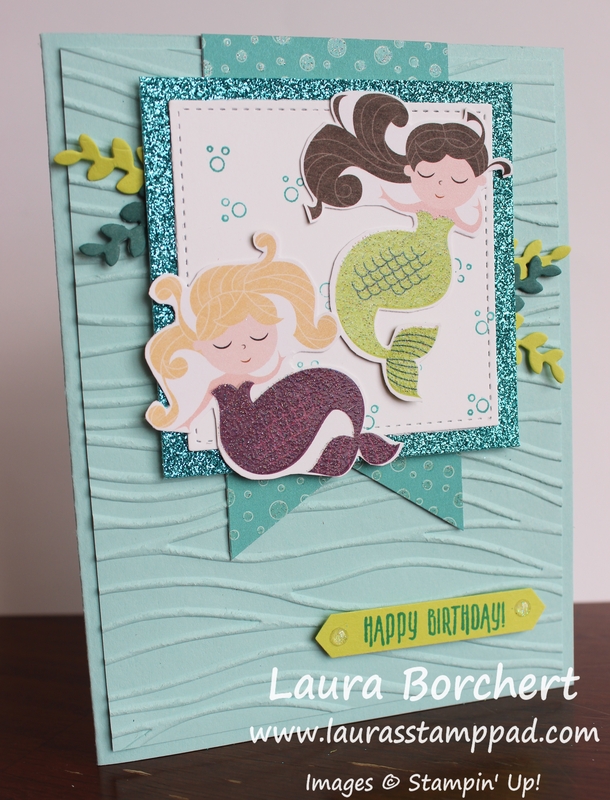 The Tranquil Textures Designer Paper that I used for this card is one of the select packs!! Click here to see them all! 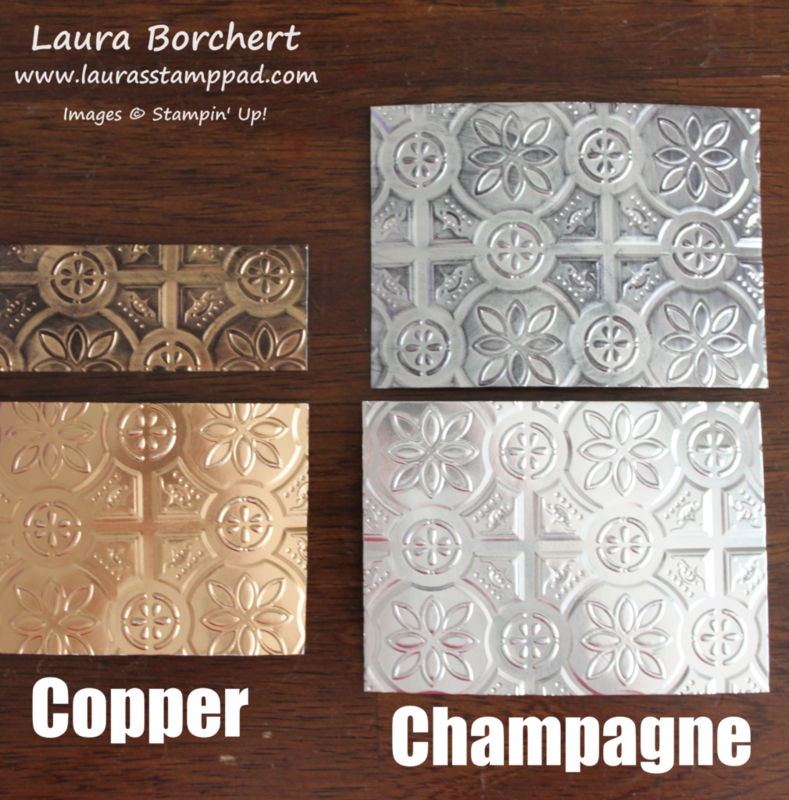 Technique Tuesday – Tufted Embossing Folder Tip!!! 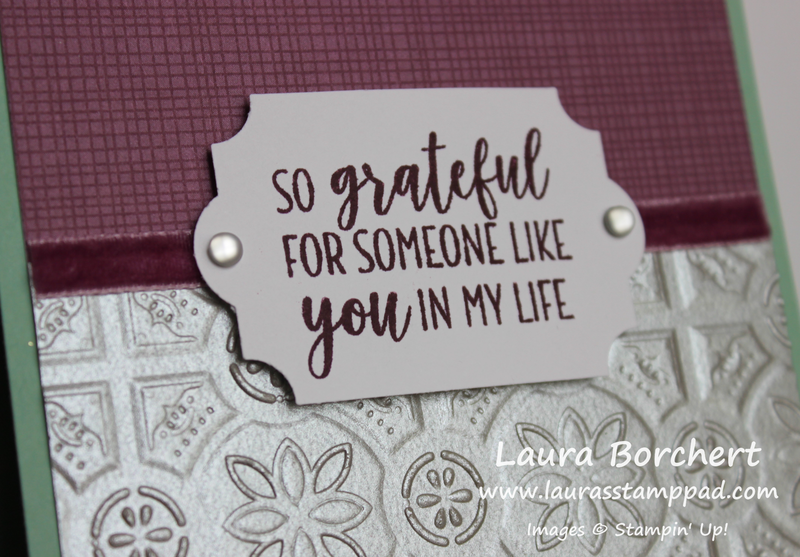 When I was using the Tufted Textured Impressions Embossing Folder to create a card, I noticed this line! At the bottom of the folder, there is a line straight across. If you line up your cardstock with that line, your embossed image will be straight on your cardstock. How cool is that?!?!?! MIND BLOWN! This little line made it really easy and quick to pop in the cardstock and go. Multi-Purpose Platform – if it is the older style with the hinges, open up Tab #2. If it is the newer style, leave off the Adapter layer. I hope you found this super helpful!! Let me know if you get excited by the little things like this! 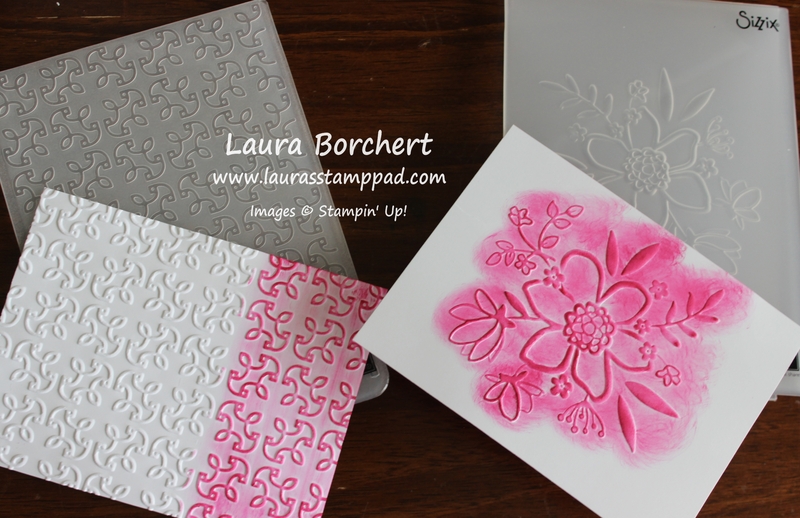 Also, let me know if you have found little tricks to your favorite stamping tools. I would love to hear them! 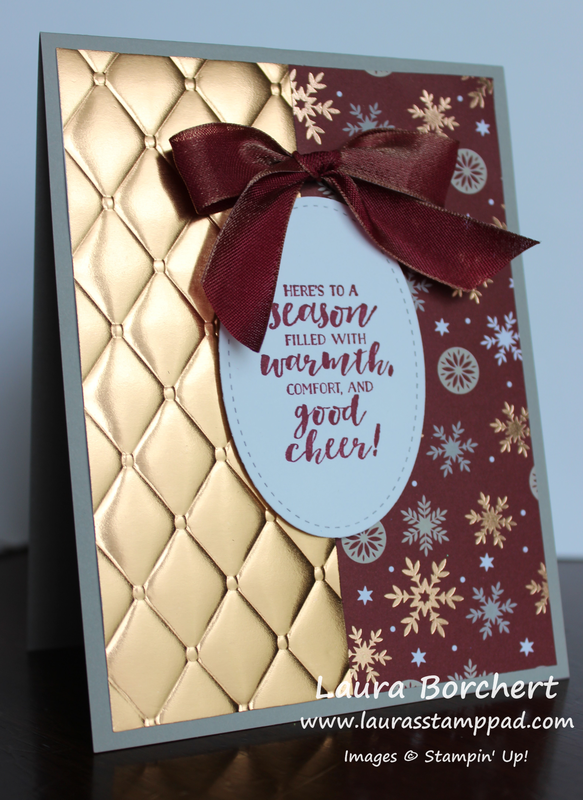 Technique Tuesday – Layering Embossing Folders!!! Both folders in the photo above look very similar and create a stunning embossed image. You might notice that when you order a folder, some are super thick and different from ones you have received in the past. These are the folders with a SUPER long name – Lovely Floral Dynamic Textured Impressions Embossing Folder (right side)! The Garden Trellis Embossing Folder is on the left side! The regular folders are much skinnier whereas the dynamic folders are thick. This makes a big difference when running them through the Big Shot. It can be frustrating trying to figure out the perfect layering. Sometimes you run it through and it isn’t thick enough to emboss and then you try another layer and it’s so tight you just might pull a muscle or break your Big Shot. I’m here to solve that frustration!!! Due to the thickness of the folder, this layering only requires one Standard Cutting Pad. Another TIP for these folders is to spritz the paper ever so lightly with some water. This will moisten the fibers of the cardstock and allow for them to press into the folder without leaving creases in the cardstock. 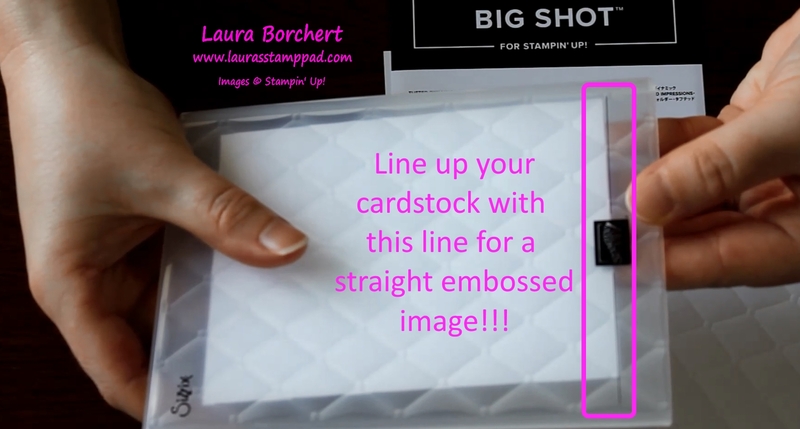 Many times I just grab my Stampin’ Mist because it’s right there and it works just as well! 🙂 You can always add some water to a Stampin’ Spritzer too! In the photo at the top of the post, the images are Embossed and I lightly went over them with a Sponge Dauber to add color so you could see the image better. In this photo here, I flipped over the image to reveal the Debossed image and added some color. Both images are stunning so keep that mind when creating your next project. 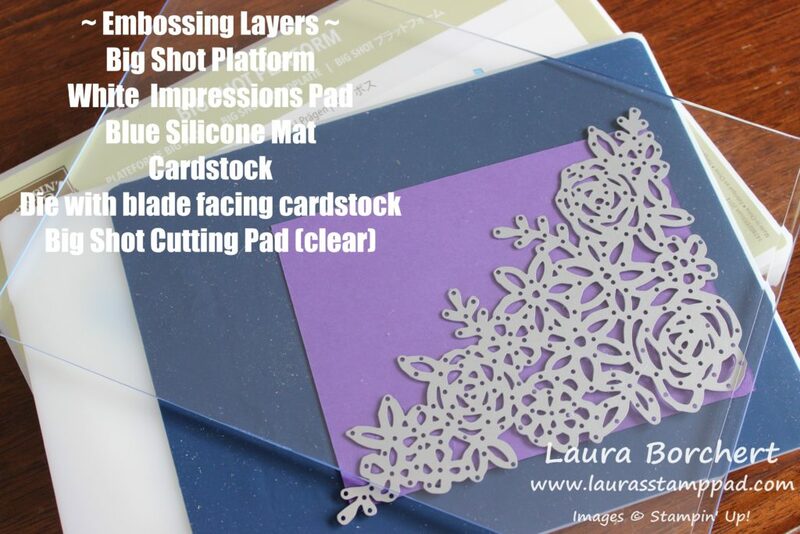 There are lots of ways to use embossing folders! This card is such a classic because I went with neutral colors of Crumb Cake and Old Olive so that the flowers in the basket can really be any color you wish! What color would you make the flowers? All one color? A variety of colors? Pink? Blue? Yellow? Orange? Let me know in the comments below! Next, I tied some Old Olive Sheer Ribbon around the bottom and into a bow. Then I added this to the card front. For the flower basket, I stamped it from the Blossoming Basket Stamp Set in Memento Black Ink. 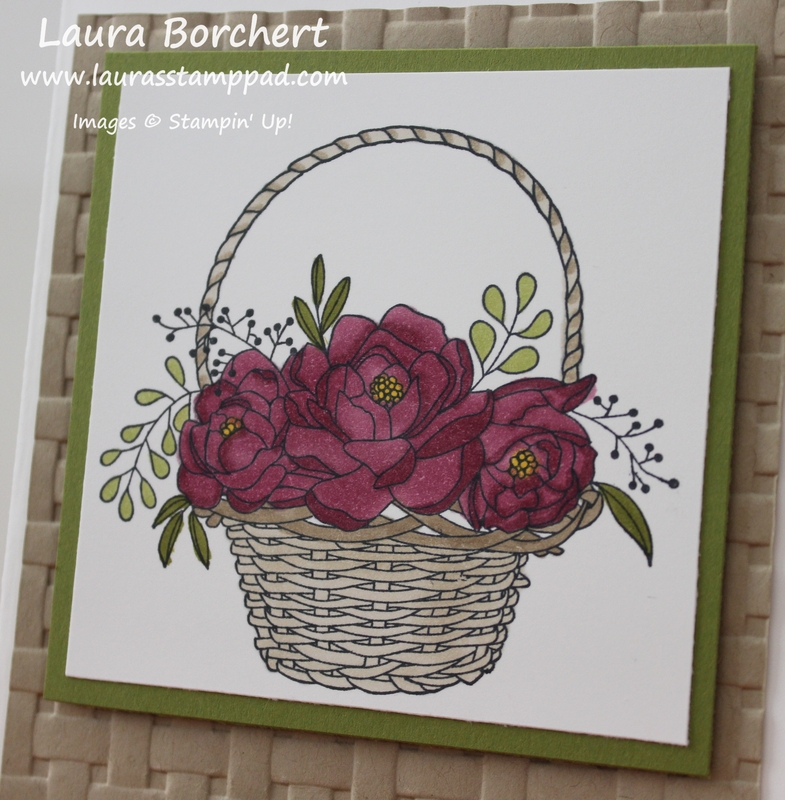 Using the Stampin’ Blends Markers, I colored in the basket and flowers. I went with Crumb Cake for the basket, Old Olive for the leaves, and Rich Razzleberry for the flowers. For the leaves, I did a few with the dark marker and a few with the light. For the basket, I did each little line on the handle with the dark and then colored over it all and filled in with the light marker. On the bottom basket part, I colored the top weave in with the dark Crumb Cake Marker and the rest with the Light. This is how I got that variation of color for it all. I love how Stampin’ Blends really make me feel like an artist when I totally am not a coloring artist whatsoever. 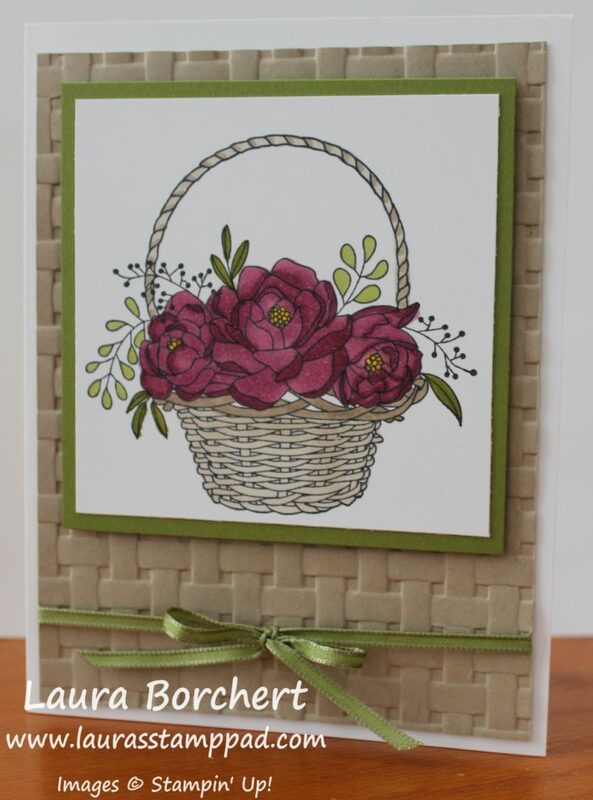 After coloring, I added this piece to a layer of Old Olive and then added it to the card front with Stampin’ Dimensionals. 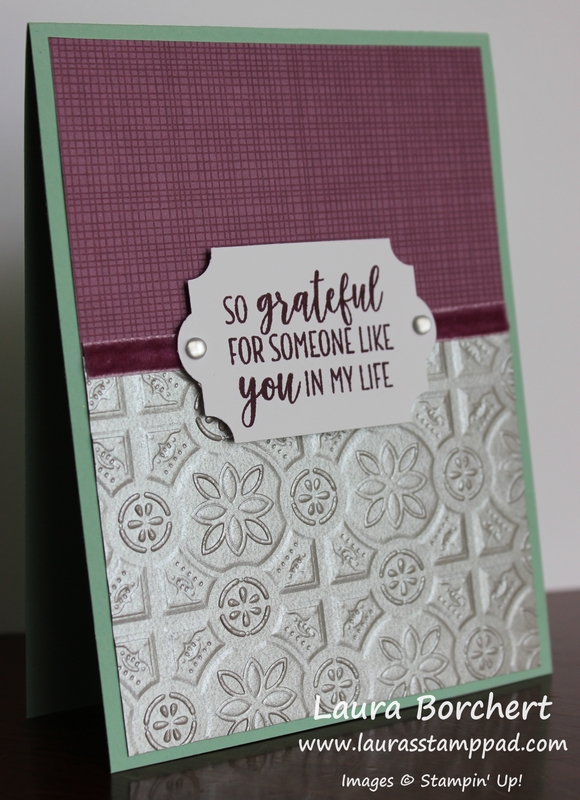 I like to use Stampin’ Dimensionals when adding layers to a embossed layer because the foam falls into the grooves of the cardstock and hold tight as well as looks smooth! Plus you all know how much I LOVE Stampin’ Dimensionals. Don’t forget to let me know in the comments below what colors you would use for your basket of flowers!